Who would have thought that invitations that look like lollipops would be my BIGGEST seller?! These invitations look SO unique. The swirl background is my own custom made image. The top part of the invitation slides around to open up the card. This is a 360 degree card because even if you turn it around with the cover facing the floor, you’ll see a lollipop swirl. The invitation itself measures 5 in. and they fit perfectly into 5 3/8 x 8 3/8 greeting card envelopes. 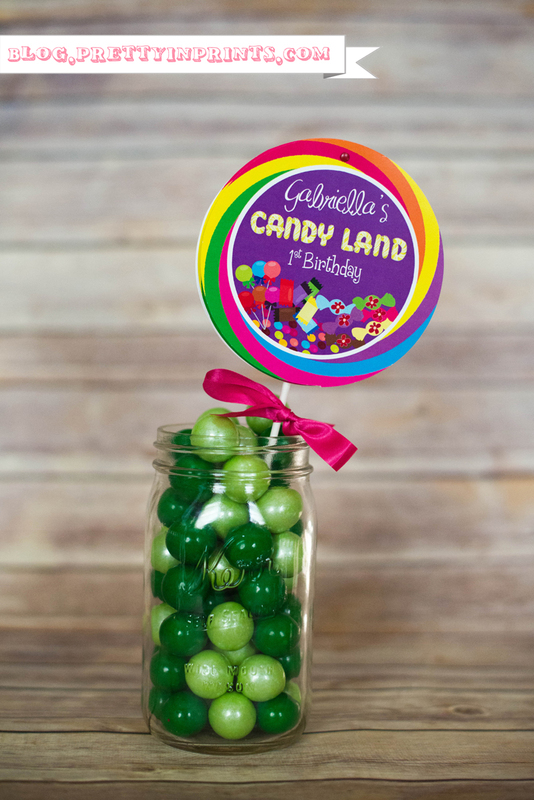 What a perfect way to invite your guests to a Candyland-themed birthday party! These invitations are great for birthdays, baby showers, SWEET sixteens, prom, and so much more! Sadly, with 3 kids (one being a newborn), my design business and a booming photography business, I no longer have time to make these invitations. I keep getting so many inquiries about them, that I’ve decided to sell the PSD files so that you can customize, print and assemble the invitations yourselves. The original invitation file can be purchased here, while the adult version can be purchased here. “Like” my Facebook page and get 10% off shipping on your next order! Looking for matching favor tags? Visit my Candyland Favor Tags blog post to see pics and specs. Design Ideas: There’s just so much you can do for a Candyland party, it’s hard to find where to start. How about using matching lollipops as centerpieces and favors. 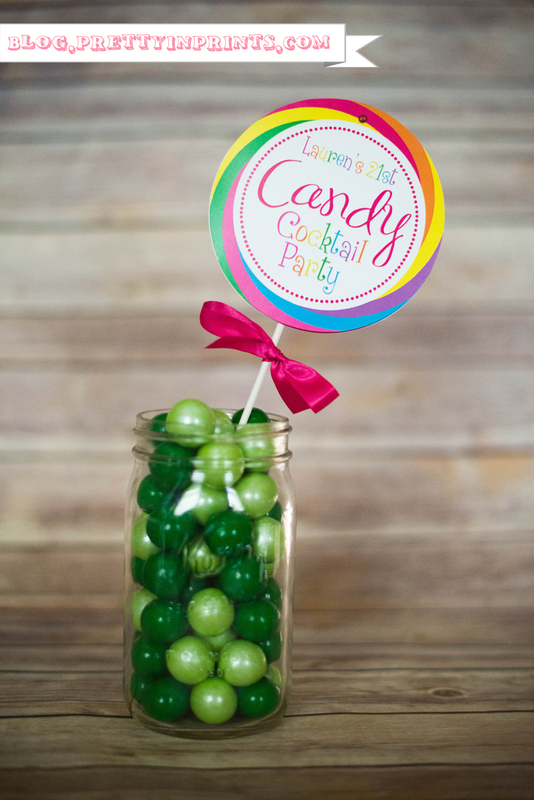 You can create matching round labels to stick onto the REAL lollipops saying, “You are so sweet-thank you for coming!” You could also have a crafts table where the kids can make candy jewelry by threading hard candies on a string. If you’re up for the challenge, you could even decorate using candy. You could easily make a wreath out of large lollipops. To top off the Candyland theme, set up a candy bar! Put candy in different sized (and different shaped) glass containers and let your guests dig in. How much do the lollipop invites cost? Do they include the envelopes? Hi you sent me a quote a few months ago but I have misplaced the e-mail. please send me this information again. I love these invites!!! I am looking for a price quote on 50 of them, or if you can even tell me how to make them either would be great! You are very creative! Look forward to hearing from you! I would like to purchase 50 invitations for my daughters candy party. can you please tell me how much this would cost? I am have a candy themed sweet sixteen, and i will love if you can send me your prices for 150 to 200 invitations because they will be perfect to set the mood for my party. I would like to know pricing on 30 -50 invites these are adorable!! Hello, i want to know how I can go about ordering these invitations. How much do you charge per invite and how quickly can these be printed? Please let me know. How much do you charge for 50 invites? Hi, I’m having a sweet 16 and i was wondering if you could make me these invitations. I would gladly appreciate if you emailed me the information. These are adorable! How much do you charge for 50 invites? I am having a sweet 16 and i would need about 250 of these could you please email me with a price quote. I would like to know the price for 100 invitations. Thanks! I would like to know how much formthe lollipop invites,i will need 100 of these invitations? Heyy so im turning 18! And wanted to know if this is too childish? And how much is it for 50 invitations. Hi, am interested in purchasing about 20 invitations if you are still making them. Hi! I’ve made this invitation for many 18 birthday parties, sweet sixteens and quinceaneras, so it’s definitely not too childish! i am interested in purchasing 30 lollipop invitations. could you please contact me. Thank you. I need a quote to see how much 100 candy invitations would be. Please contact me as soon as possible. How much for 100 of these invitations. I have been looking for Candyland invitations for months & I’m so glad I FINALLY stumbled onto these- they are fantastic!! Are they still available & what is the price?